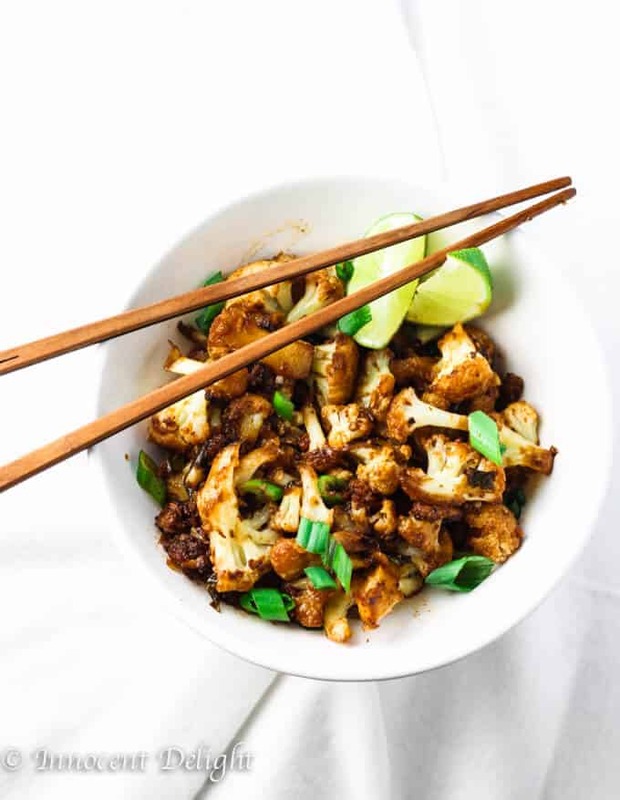 Let me just say this….this Spicy Siracha Cauliflower is by far the best cauliflower I have ever eaten. 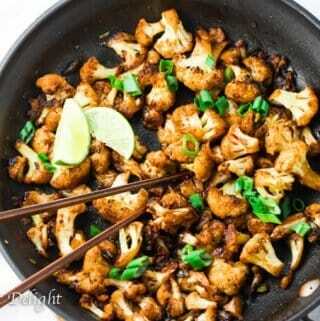 I love cauliflower and am always looking for the interesting recipes. This one I found on Pioneer Woman. 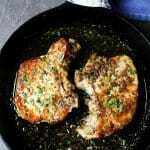 Rae was right, once you’ve tried it you’ll put this recipe into heavy rotation. After the first time I made it, I couldn’t stop thinking about it. Seriously, it was that good. I was obsessed. 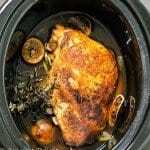 My husband likes to have a variety of dishes, so unfortunately there was no way I could just make it again the next day, although I was dying to. I waited a week… It was a long week…. If you haven’t already guessed it, I’m a huge food lover; but I can totally eat the same dish over and over until I’m bored. 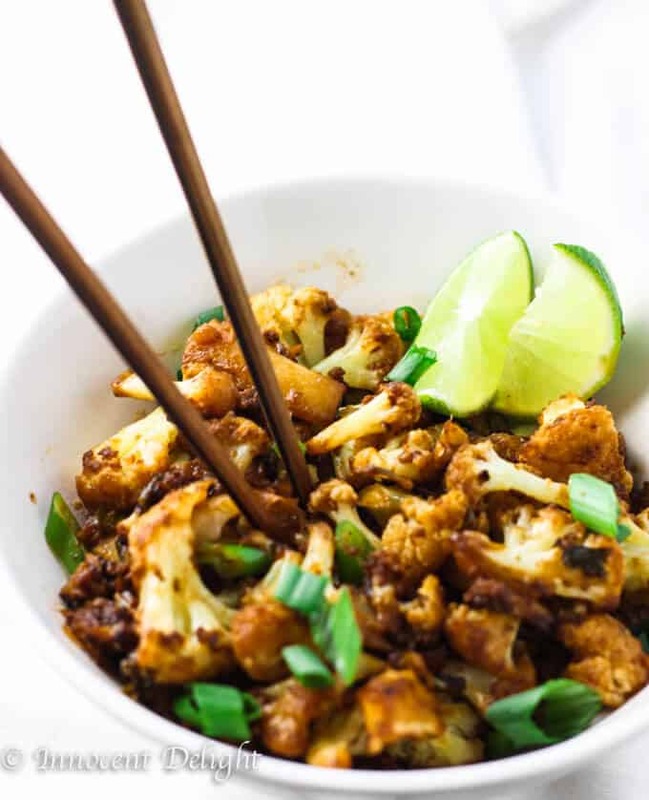 If I could, I would eat this Spicy Siracha Cauliflower several days on a row. It’s a weird character trait of mine, but I’ve had it ever since I can remember. 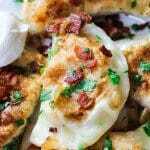 Once, when I was in my early teens, I was obsessed with mashed potatoes with sour cream and butter. I wanted to eat it every day. But this wasn’t as bad as my french toast phase when I was in high school. It may be difficult to explain as the American school system is totally different, but my class in high school (which consisted of about 25 people, but my year had 4 or 5 classes like this) had something like a major – which was the history of the cinema. It was a very cool concept. We were watching old and new movies. We learned about the history of cinematography and were writing screenplays as homework. One time we attended a special screening of the movie ‘Kramer vs. Kramer’ and I’m pretty sure that everyone from my class remembers how pivotal a role French Toast played. It was many years ago so I don’t remember it as vividly, but I do remember that the father during the divorce learned how to make French Toast. The first time he made it he broke the bread and tried to soak it in a coffee mug. However, by the end of the movie he was real pro and his toast looked amazing. Anyhow, the first thing I wanted to do after that movie was to try French Toast. I went to the store, got white bread, eggs and milk, and I was making French Toast every day 3x a day for a long while! That’s how obsessed I was. 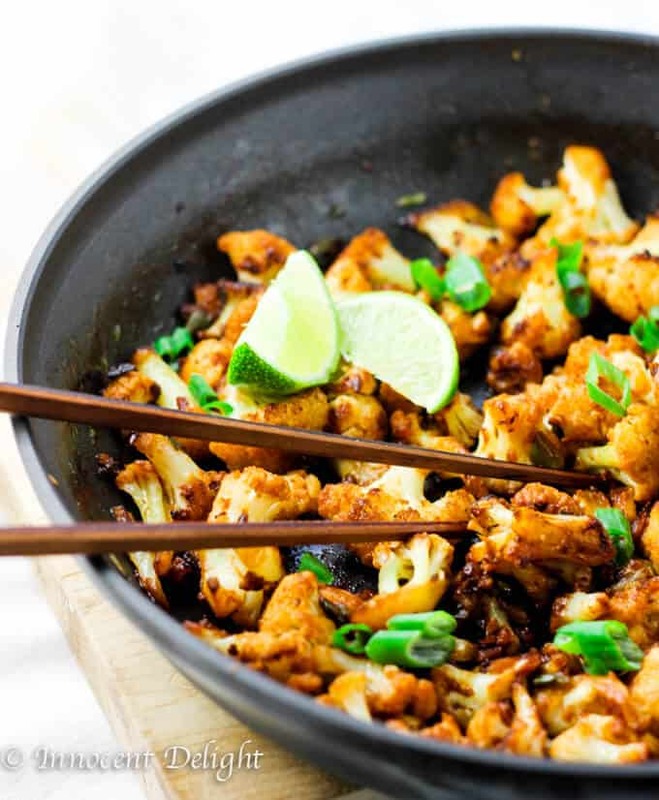 Now, you may be able to better understand why I wanted to have this Spicy Siracha Cauliflower every day. I know these are ridiculous obsessions. 1. 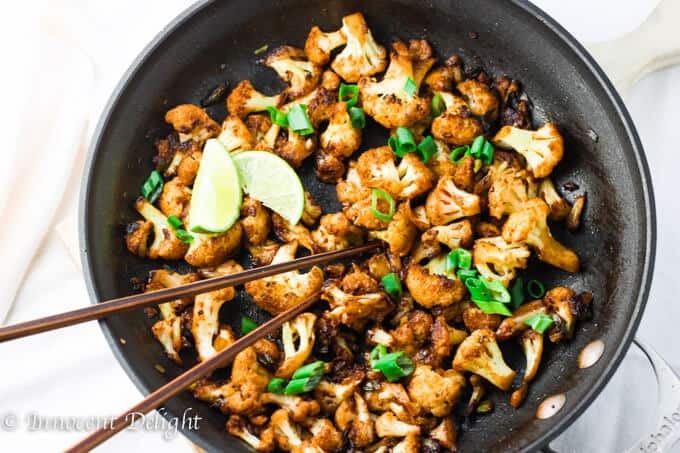 I used ghee (or butter) instead of oil as cauliflower soaks it and the smell of buttered cauliflower is unbelievable. 2. 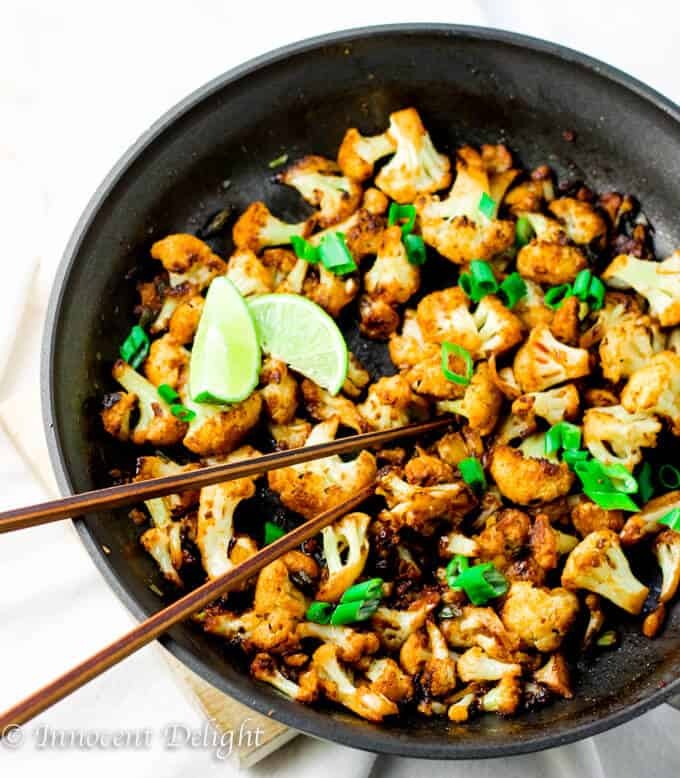 I also didn't add garlic right away as I didn't want it to get burn, so I started with just the cauliflower and once it was almost done I added garlic and let it cook for 1 minute. 3. I added a little bit more soy sauce that 2 tablespoons but it's up to your taste. Made this tonight! My husband, the one who won’t touch cauliflower, ate this up without any complaints! Yay! I ended up adding zucchini noodles (zoodles) and spinach at the end to make a new zoodle dish. Thanks for a new recipe!